A reliable internet connection is a must for businesses today—it’s how you stay up and running, it’s how your company keeps up, it’s how you stay in business. A great internet connection with sufficient speed to support all devices and users—many, if not all, on your workplace Wi-Fi network—is crucial. Managed Wi-Fi from SCS lets you rest easy as we set up and maintain your Wi-Fi network to maximize performance. On-site connection of up to five, simple devices (additional simple devices are $15.00/complex connections will be billed on a Time and Materials basis). Sync up to ten, simple devices at the time of installation – $15.00/additional device. A gateway routes data from place to place, just like a router, but more efficiently and specifically based on the type of data being routed. Gateways allow for other media connection types (like USB and VOIP Ports) and act as the central component in an integrated voice, video, and data network. A gateway puts more intelligence and control into your business. One Wi-Fi extender – Mesh unit – for hard to reach or dead zones. Also good for extending your Wi-Fi to your garage or yard. Additional Mesh units – $5.00 each per month. Q: I already have a router, why do I need another one from SCS? A: Your router’s technology may be outdated without you being aware of it. 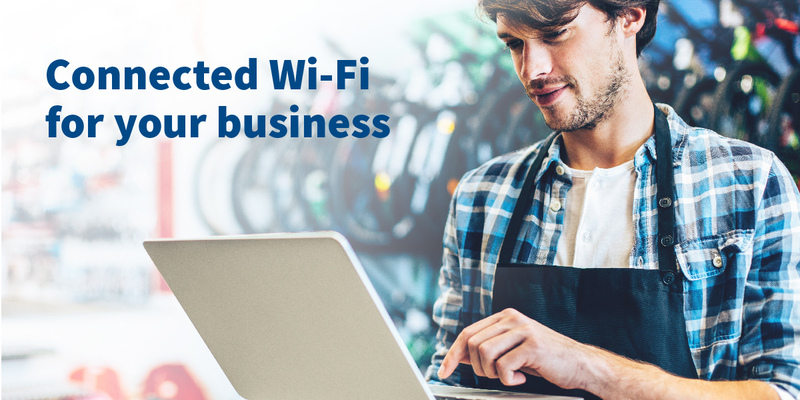 When shopping for a new router for your business, it may be difficult to know what to purchase—many wireless routers may not send a strong enough Wi-Fi signal to all parts of your business. You may pay for a higher speed internet connection, but your router may not be allowing that level of speed to all your connected devices. Q: Why should I pay a monthly fee after I get a SCS router installed? A: Routers are electronic equipment and, as such, have the potential to stop working or work with reduced efficiency. If you add more wireless devices over time, it can impact the performance of your wireless network. With SCS’s Wi-Fi services, we maintain the router to make sure it operates at peak efficiency. If necessary, we replace the router free of charge. We provide regular router software updates, and our technicians can diagnose and troubleshoot issues remotely. Q: What’s the difference between “Wi-Fi” and “internet”? A: People often use the terms Wi-Fi and internet interchangeably. Wi-Fi and internet are two distinct services and knowing the difference is important: the internet is a network that connects computers around the world. To access the internet, you must subscribe to service from an Internet Service Provider (ISP) such as SCS. A Wi-Fi network is independent from the internet. The devices in the network connect wirelessly to a Wi-Fi router and together they form a wireless local area network (LAN). The Wi-Fi router is connected to the internet source via a broadband modem (in some cases the modem and Wi-Fi router are one piece of equipment). Devices connected to a Wi-Fi network can work together and share information. You control your Wi-Fi network, including where you place your router, security restrictions, determining what devices can access it, and which devices can share information with other devices. *As long as the Managed Wi-Fi program is activated, assuming normal wear and tear. **Additional simple devices are $15.00/complex connections will be billed on a Time and Materials basis.